The City of San Jose (Calif.) is demonstrating that when more than one green infrastructure measure comes together, impervious areas responsible for chronic stormwater management problems can become key parts of the solution. The effectiveness of “green streets” — combinations of rain gardens and permeable pavers which work together to control roadway runoff — has been championed by the City of San Jose. Crews have already brought green streets to traffic-heavy locations around the city, with additional installations planned for the near future. San Jose Environmental Services. On Nov. 4, the City of San Jose Environmental Services Department (ESD) unveiled stormwater-focused retrofits to Park Avenue, a main thoroughfare in the Rose Garden neighborhood. The $1.29 million pilot project brings approximately 1981 m (6500 ft) of curbside rain gardens to medians and sidewalks along the avenue and replaces 260 m2 (2800 ft2) of asphalt with permeable pavements that guide stormwater runoff into the gardens during heavy precipitation. “Green streets,” the combination of vegetation, soil, and engineered systems such as permeable pavements to control the flow of stormwater, are an ideal solution for Park Avenue, which lies adjacent to the Guadalupe River. Installed at seven locations spanning four intersections, the green streets will prevent motor oil, grease, and other street-traffic discharges from washing into the Guadalupe River, flowing through downtown San Jose, and eventually discharging into the South San Francisco Bay. 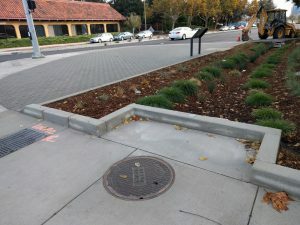 Project partners, which include ESD, the City of San Jose Department of Public Works, and the California State Water Resources Control Board, designed the Park Avenue installations with the state’s drought-era water conservation resolutions in mind. “The plants selected have been found to work well in these rain garden settings. They are drought-tolerant. They do well with the filtering soil, and can also handle being inundated by water,” Jennie Loft, public information officer for ESD, told The Mercury News. By retro-fitting existing structures rather than building new ones, the city saves on implementation costs and causes minimal disturbances to everyday transit. To pay for the project, the state allocated nearly $860,000 in California Proposition 84 Stormwater Grant Program bond revenue, supplemented by an additional $428,834 from San Jose. A $1.29 million pilot project brings 1981 m (6500 ft) of curbside rain gardens to medians and sidewalks along San Jose’s (Calif.) Park Avenue. It also replaces 260 m2 (2800 ft2) of asphalt with permeable pavements that guide stormwater runoff into the gardens during heavy precipitation. San Jose Environmental Services. The Park Avenue green streets are only the latest addition in an ongoing campaign to minimize runoff generation from San Jose’s busy roads. 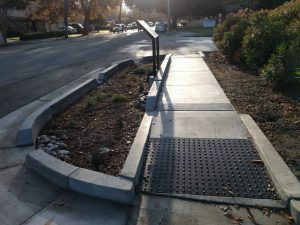 Also in 2017, the California Department of Water Resources joined with the City of San Jose and the San Francisco Estuary Partnership (Oakland, Calif.) to plant approximately 520 m2 (5600 ft2) of curbside rain gardens and enhance existing dirt medians with drought-resistant plants and tree wells along Chynoweth Avenue in the southern part of the city. In recent years, city crews also established three “green alleys” in the Martha Gardens neighborhood. These projects covered a collective 3251 m2 (35,000 ft2) of previously impervious or unusable space. Workers also cut into an Autumn Parkway median to allow stormwater to flow across all parts of the thoroughfare into rain gardens along the sidewalks.